So, you may have noticed me saying “we” a lot lately in my posts and I’m really excited to announce that Lali Doll Nursery is now more than just me. My husband Dan has been making the waldorf doll heads for me ever since I started making waldorf dolls but he’s now helping me out every day with lots of other things. We’ve began a whole new way of getting “our” dolls done proficiently. My husband has so many great ideas and we’re having so much fun working together. This is my favorite of his ideas; Oh Yeah! 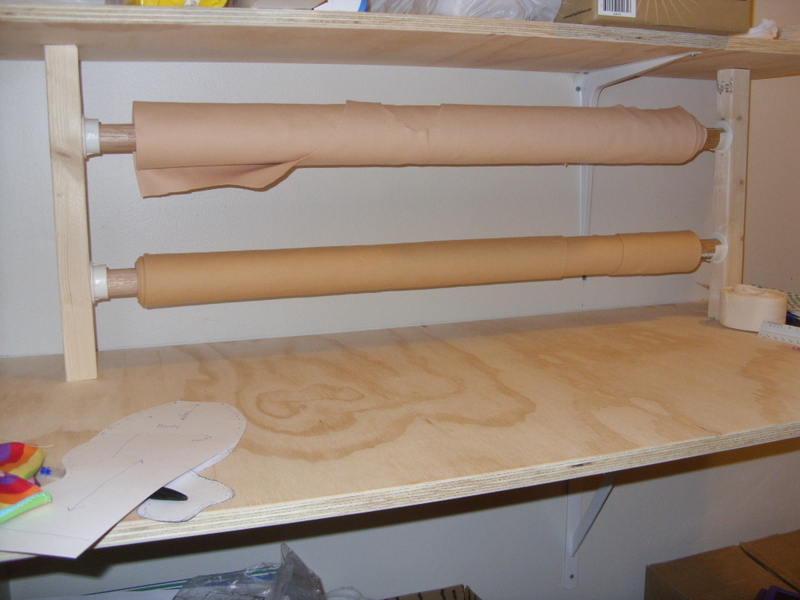 A work table with rolls of doll skin (Complete with a top shelf). Makes it much easier to just roll out and cut because this stuff is bulky otherwise. It’s nice to have a space that doesn’t have loads of things piled on it (Not like my desk on the other side of the room) Dan is definitely the level headed and organized half of this business. As most of you probably know putting together a waldorf doll takes a LOT of time. We are a homeschooling family and that takes up quite a bit of the day too, so without help I’ve only been able to get a couple dolls made each week. Now, with two of us, we plan to have 5 dolls available every week. 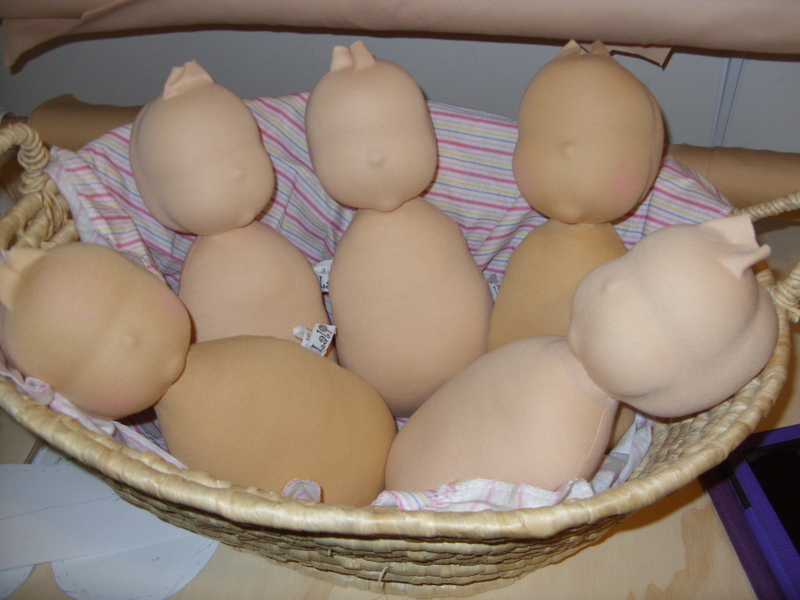 Something I’ve tried half heartedly in the past was working on several dolls at once in stages. I’m always just dying to see who’s behind that face I’m working on and can’t wait to get it together to see her personality blossom. I can easily spend an entire day just working on one doll and still not be finished with her. I waste a lot of time piddling to be honest, trying different wigs/hair/clothes on the doll. Grown up playtime I guess, ha ha. It’s something that I just enjoy doing. So, when the idea of doing them in stages came up again, I was a little discouraged, thinking it would take the joy out of it but what I’ve found is that I am actually really enjoying it. Since we are still working on a small scale of only 5 dolls each week, at the end of the week is “play time” I get to enjoy my favorite part of doll making 5 times at once now. It’s a comfortable flow and I’m loving it. Our next Doll Upload is scheduled for Tuesday May 15th 10am EDT in the “Doll Shop” (link above). Sometimes I work on just one doll at a time but more often I get a whole bunch, 5 or 6 made to the blank doll stage and then work on an individual doll giving it face, hair, clothes and getting to know her/him. Wow! That’s super interesting! Thank-you for sharing a piece of your live with us. I would love to see more photos inside the ‘doll shop’ I enjoy looking on Pintrest at artist studios to see where people are inspired and get creative. I just rebuilt my entire sewing/art studio based on some ideas I found and I’m loving the open bright space. Wish I had done this years ago! Thanks Alison. I will get more photo’s as we journey through the year 😉 I always like to have a peek at other studios too!